It's been forever since I've posted but I've been busy! I had a wonderful but busy holiday season filled with family, friends at work, work, and moving. There was great food, time with the people I love and the magic of the season. Although it was jam packed full, I wouldn't have traded it for the world. I used Little Honey's Little Red Riding Hood Honey because she's one of my favorite images and Fairy Tales! I love the show Once Upon a Time and the gal who plays Red is one of my favorite characters. Love that show and can't wait to watch it tonight! 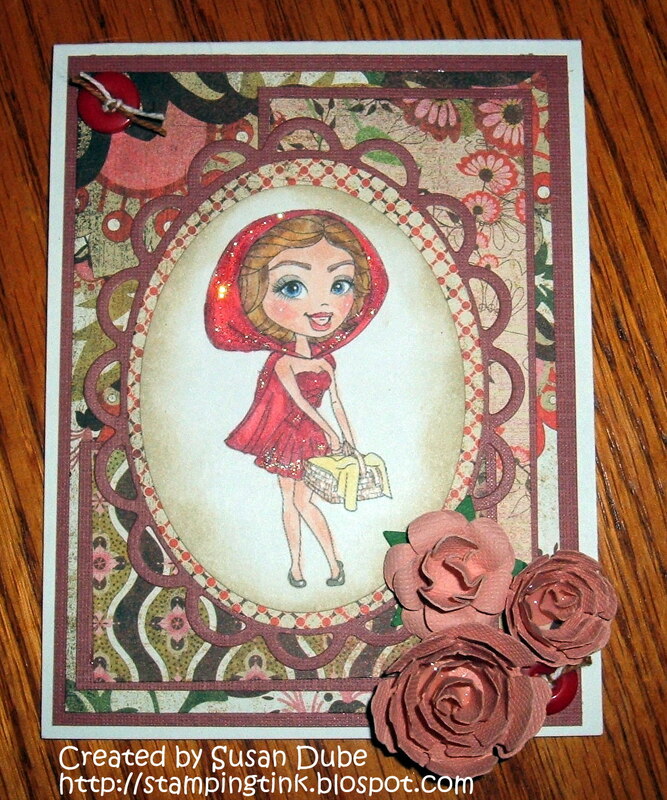 I colored Red with copics and Spectrum Noir markers and used some older Basis Grey papers.n I added some stickles to her cloak and the buttons and baker's twine are from Close to My Heart and I made the flowers with my cricuit cartridge and Nestabilities. Here is this beauty close up. This image is exactly how I always pictured her, all bright eyed and beautiful! I will confess that I had some help making her and here's my Allie showing off her treasure. It tool a little longer to finish her but it was time well spent! 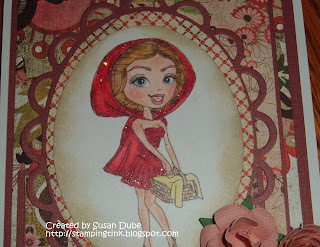 Hope you enjoy her and head on over to Crafting When You Can and join in and show us your favorite things and at Scrappy Frog's Challenge Blog and show us what you've tried that's new! ! Susan, I love, love, love this! It turned out so gorgeous! Naturally I love the sparkle you added to her cloak and the coloring is wonderful. 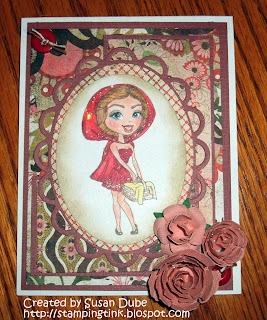 Great die cut and beautiful added flowers. Once Upon a Time is one of my favorite shows too. So cute...and the card is great too! Great card. Susan. I particularly like the adorable model showing off your work. what a cutie. Echoing everyone's perfect thoughts -- cute card and an even cuter model!!! A beautiful card Susan, the papers and flower make it look like she's walking through Grandma's garden, safely delivering her goodies. Thank you for the shout out about the CWWCC blog. I really like Once Upon a Time too. 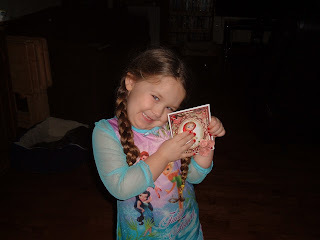 Love, love your card and Allie is so adorable!! !